THE COURT OF PROTECTION in 2018 - Everything you need to know! 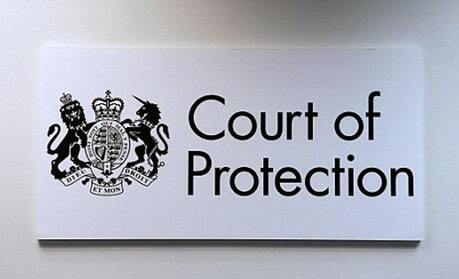 Home » Blog » What does the Court of Protection do and how can it help you or your family? Published on 26th February 2018 . What is the Court of Protection and how can it help you or your family? 1. What is the court of protection? The Court of Protection (COP) makes decisions on financial or welfare matters for people who cannot make decisions at the time they need to be made. When a family member, friend or loved one lacks mental capacity to make their own decisions it can be a traumatic time for all involved. It will be difficult or impossible to deal with any assets in their name as authorities will only deal with the person who lacks mental capacity. In an ideal world, the incapacitated person will already have in place valid health and welfare lasting powers of attorney as well as property and financial affairs lasting powers of attorney, appointing chosen people to step into their shoes and manage their affairs if the need arises. But making lasting powers of attorney is not always possible. The person may already lack mental capacity when such documents would be useful or if there are powers in place then perhaps they are no longer fit for purpose. Here is a short video explaining more about the Court of Protection. In order for a person to take control of someone’s affairs, they will need to apply to the COP. The foundation of any COP application is an assessment of the mental capacity of the individual to whom the application relates, usually referred to as the “patient” in court. There are also court of protection costs that you will have to pay. More information on this is below. Once the COP is satisfied the patient lacks mental capacity, they will then look at the application being made and decide whether to issue a court order. The COP will want to hear all sides of the story and may direct relatives, friends, carers or other interested parties to be made aware of the application. 3. What is a deputy? 4. What can you do as a deputy? There are 2 types of deputy that you can apply for. Under a property and affairs order, you as the appointed deputy can take full control of your loved one’s financial affairs. You can streamline their accounts, pay off all their debts, and apply for benefits that they may be entitled to. You can also sell their home if they are in residential or nursing care and their care fees need to be paid from the sale proceeds. As opposed to the financials, you will have responsibility to make decisions about the individual’s medical treatment. 5. How to make an application to be a deputy? Typical applications to the COP include applying to be a patient’s “deputy”. The end result is similar to that of being an attorney under a lasting power of attorney where in most circumstances a deputy has general control over property and financial affairs. However, the deputy must demonstrate to the COP they are fit for the role and will have various levels of court supervision during their tenure. Applications can also be made for “one-off” decisions such as making gifts or signing a “statutory Will” (signing a Will for someone who lacks mental capacity) on behalf of the patient. These can be complex applications requiring a detailed assessment of the patient’s affairs. All parties that may be affected by the COP issuing an order in favour of the application will be invited to have their say. The COP is increasingly being asked to decide on health and welfare matters. It is rare for the COP to grant a general health and welfare power to a deputy but they do consider one-off decisions perhaps if there is a disagreement as to a care provider. The COP can step in to make a decision where there is a deadlock. If you find yourself in the position of having to consider a COP application then seek professional advice. 6. What are the responsibilities of a deputy? If you are appointed as a deputy it is your responsibility to help someone make decisions or make decisions on their behalf. When doing so, you must consider someone’s level of mental capacity every time you make a decision for them. This is because you cant assume that their mental capacity always stays the same, as things can change. When you get a court order from the Court of Protection it will say what you can and can’t do. You can also find general rules in the Mental Capacity Act 2005 Code of Practice. 7. Can I make welfare decisions? You can only make welfare decisions if you have applied and been awarded the personal welfare order. Then and only then can you make decisions for your loved one and decisions that you can make will be stipulated in the order by the court. 8. Will I have to report to the Court with decisions that I make? As a property and affairs deputy, you will be expected to complete an annual account on a yearly basis and this will document what decisions you have made on behalf of your loved one during the past year. It is very important that you document all that you do for your loved one, keep good clear records of everything that you have paid out and keep all receipts and statements. 9. What happens if I can no longer act as deputy? If the appointed deputy can no longer act for the person who has lost capacity for whatever reason, another application would need to be made to the court for a new deputy to be appointed. 10. What happens if the person the order is about regains capacity? If this happens, then an application would need to be made to the court for dispensing of the current deputyship order; medical evidence would also need to be submitted confirming the regaining of capacity. 11. Can I be paid for acting as deputy? No. Only a professional deputy can be paid for dealing with financial affairs under a deputyship order. A lay deputy (a non-professional) person can claim reasonable expenses. 12. When does a deputyship order end? The order ends on either the death of the person who has lost capacity or if they regain capacity and are now able to deal with their own affairs. 13. What are the Court of Protection costs? When you make an application to become a deputy, there are certain court of protection costs that you will need to pay. You will also need to pay some fees after you have been appointed. Its important that you understand what these are. When you make an application, and you send off your application form, to become a deputy, you must pay a £400 fee. You need to pay the application fee twice if you’re applying to become both a property and financial affairs deputy and a personal welfare deputy (see above). If the court decides that there needs to be a hearing then you will also need to pay a £500 fee. The court will confirm to you if this is payable. You’ll also need to pay £500 if the court decides your case needs a hearing. The court will tell you when you need to pay this. Your annual supervision fee is due on 31 March for the previous year. You’ll also need to pay a £100 assessment fee if you’re a new deputy. Its worth noting that in some circumstances you may be able to claim a refund of your fees. A very useful guide explaining why you should use a professional when setting up a probate. A blog explaining how you can safeguard vulnerable adults. 10 important reasons why you should have a lasting power of attorney. A blog on the importance of ensuring you have a will in place. Are you looking for some professional help in applying to the Court of Protection? We know how confusing it can be! The UK Care Guide, along with Trust Inheritance, is here to help you. You can call us, or leave your contact details below, and a professional will help you and hold your hands through the whole process. Please note that full professional costs are typically between £1,800 and £3,000 for the application and dealing with the Court. Would you like some help applying to the Court of Protection? If so, you can call 0800 840 1187 and a professional will support you. Or leave your details here and someone will be in touch.